Octave V 80 SE/Super Black Box review | What Hi-Fi? Octave Audio is a new name to us here at What Hi-Fi?, but the company’s heritage goes back over 40 years to when its founder, Andreas Hofmann, first started developing amplifiers. After spending time with this German unit we can’t help feeling that it’s a shame we’ve waited so long to review an Octave product, because the V 80 SE is terrific. It’s a valve amplifier for those that don’t want the fuss of valve amps, without sacrificing the sound quality potential of the much-loved technology. The engineering team’s starting point for the V 80 SE design was to take a look at the traditional weaknesses of valve-based amps and try to eradicate them. The list of weak points included short tube life, limited power output, poor compatibility and high distortion. Octave also wanted to make owning this amplifier as painless as any transistor alternative. It’s a tall order, but we think the brand has succeeded, helped in large part by the use of a sophisticated control system that not only ensures the power valves – a quartet of KT150s – aren’t put under any undue strain on start-up, but also makes routine adjustments such as biasing easy. Typically, as a valve is used its electrical characteristics alter, which means the amount of electricity flow it requires for optimal performance changes. On a conventional product it’s a relatively simple periodic adjustment, but still involves prodding around the circuit board with mains electricity and thousands of volts in close proximity. Understandably, the idea of this is unlikely to appeal to many people. Octave has made things easy with a LED-based system where all adjustments can be made using a small screwdriver from the front panel. Nice. Octave tackles the compatibility, distortion and power issues with a carefully considered Pentode circuit backed up with high quality output transformers. The sound of a valve amplifier is heavily dependent on the capability of its output transformer. Octave designs and builds these transformers in-house, giving it a huge advantage over rivals that buy these components in from OEM suppliers. The result is a claimed power output of 100W per channel into 8ohms, which is deeply impressive for an all-valve design, and significantly more than normally produced by valve integrateds we’ve reviewed. The V 80 SE’s circuit is flexible and it’s possible to switch out the KT 150 power amp valves for alternatives such as KT88s, 6550s and KT100s if you wish, though the power output will be reduced. As expected at this level, the company has paid a great deal of attention to getting the power supply right. This starts from enclosing the mains transformer in a magnetically shielded housing (and potted with resin), and extends to extensive filtering with dedicated feeds to the different valve sections. It’s all done to minimise noise – mechanical, electrical and magnetic – and reduce sonic distortion. Move away from the innards and there’s plenty to admire in the casework. While the appearance certainly isn’t to all tastes, there’s no denying it is beautifully made, with neat, crisp edges and a feeling of solidity. The positive action of the control dials, with a nicely damped precision and satisfying heft, reinforces this impression. It adds up to a product that feels like it’ll last decades, which it should do at this price. We mostly like the simple metal remote – a nicely sized wand with just two buttons to control volume. We have complaints though. Firstly, if you want one you’ll have to pay £150 on top of the V 80 SE’s hefty price, which seems ridiculous, and secondly, the volume buttons feel a touch vague. But elsewhere, Octave has been generous with the features. There’s a plentiful supply of line level connections, including balanced XLR, as well as an optional moving coil phono module (add £550) for those that need it. Unusually, the company also makes it easy to split the pre and power sections of this amplifier – just turn the small dial on the right to Extern(al) – making it simple to upgrade either section, though good luck in finding something notably superior. It’s also unusual to find a headphone output on a valve amp. The V 80 SE doesn’t use a valve-powered circuit though; instead the company has come up with a dedicated solid-state module that will suit headphones with impedances between 30 and 2000 ohms (that’s the vast majority). There’s a small toggle on the back that switches the headphone circuit on. It’s a shame the 6.3mm output is hidden awkwardly between the chunky speaker terminals. This makes it hard to get to. Look carefully at the back panel and you’ll also see a connector for Octave’s Black Box upgrades. There are two versions - the standard (£910) and the Super (£2395) we have on test here. In simple terms they add extra capacitance to the V 80 SE’s power supply. The basic one increases the storage capacity by a factor of four while the premium option takes that up to a factor of 10. We have to say, on paper at least, those prices look eye-wateringly steep, but as ever, we listen with an open mind. Octave wants this amplifier to be reliable. There’s a built-in control system that manages the current flow through the circuit, so if you do something like switch the V 80 SE on and off quickly – a no-no with valve products because it puts serious strain on the components – the system will control the current flow to ensure that they’re not unduly stressed. More valve stress means a shorter life and less reliability. There’s also an Ecomode that switches off the valve circuitry if the amplifier is left unused for more than 10 minutes. This not only preserves valve life – typically around five years for the KT150s and 10 years for the smaller ones (ECC81/2xECC82) – but drops power consumption to 30W down from 180W under normal conditions. It’s a good idea and the first time we’ve seen this feature on a product such as this. We used our usual reference set-up for this test, comprising Naim’s NDS/555PS streamer, Clearaudio Innovation Wood turntable package/Rega Aria phono stage and ATC SCM50 speakers. The V80 SE worked wonderfully in this system. If you’re expecting the stereotypical warm valve sound here you’re going to be disappointed. The V 80 SE just doesn’t do that. It isn’t overtly rich or smooth and certainly doesn’t have the lush quality many people still associate with such amplifiers. Instead, this is a neutral-sounding amplifier that has plenty of punch and impressive control over bass frequencies. If it weren’t so fluid and free of hard edges you’d be hard pushed to detect any valve-like tendencies at all. We start off with Nick Cave’s As I Sat Sadly By Her Side and love what the Octave does. It’s responsive and articulate, revealing nuances in Cave’s rich, characterful voice as well as anything else we’ve heard at this price. There’s so much detail here, from the layered harmonic richness of the backing piano to the deep, beautifully textured lows. There’s also plenty of authority and a pleasing solidity to the presentation. The amplifier conveys the momentum of the music well, keeping it moving with a lovely deliberate gait. That ability to render rhythms is even more obvious when we take a listen to Janet Jackson’s If. Here the Octave delivers a wall of sound with plenty of attack and drive. There’s no shortage of composure here or the ability to keep things organised even when it’s easier to let them be messy. Through it all Jackson’s vocals come through with clarity and attitude. We move onto something larger scale in the form of Beethoven’s bombastic Fifth Symphony. Here the Octave responds with entertaining presentation packed with strong dynamics and plenty of authority. Detail levels are high and we’re impressed by its ability to keep low-level instrumental strands audible even when things get complicated. Instrumental timbres are convincing, as is the sound staging, which is nicely layered and expansive. Remember that Super Black Box upgrade? It’s simply a matter of connecting the Box’s umbilical lead into the V 80 SE. The Box itself doesn’t need to be plugged into the mains. It may cost a huge £2395, but the difference it makes to the already excellent performance of this amplifier justifies that outlay. The presentation becomes even more open and precise. There’s extra authority, greater scale and the low-end gains weight, punch and power without losing articulation. The standard amplifier is terrific, but this upgrade takes things to another level. If we were considering the V 80 SE we would definitely buy the Super Black Box too, even if we saved up for it at a later date. It’s that good. The V 80 SE shouldn’t be seen as just a great valve amp. 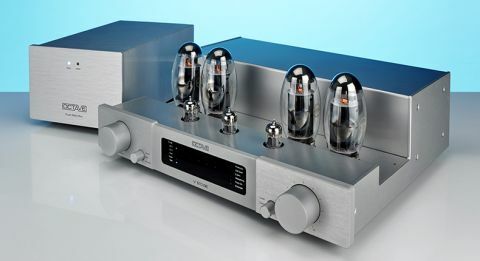 It’s a simply a great amplifier that happens to use valves. It fits into most systems with ease and has a range of features that puts most rivals to shame. Add excellent build and fuss-free usability combined with a ready-made upgrade path and you have a superb buy. Octave isn’t particularly well known in the UK, but if this amplifier is any guide we hope the brand gets the recognition it deserves.